If you would like to have your bird listed here, either for sale or free to good home, please visit the "Place your Bird" page and fill out the form or Email us. If you have a posting here and no longer have the bird, please contact us so that we may take your ad down. Click here for birds available at C&B Birds now! I have two small female zebra finches that are in good health, active and eating. They are small gray birds with black markings on their faces. They make a soft honking or beeping noise. They are free to a good home. They will come with a cage, perches, swing, and food. I have a vision cage as well as a wire cage for them. Wildbird Recovery rescued 30 Zebra Finches from a college student in May. At the time we admitted them they were all housed in one 24"x12"x18" cage that was filthy. The obviously younger birds were housed seperate and all were moved to 2 large cages with proper perch size and spacing and lots of silk plants for hiding. They are doing extremely well and those who have been adopted are very much enjoyed by their new owners. There are 2 males and 5 females still awaiting new homes. 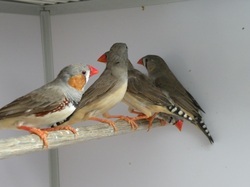 We require cage size, food, etc that is essential for their good care as detailed in http://exoticpets.about.com/cs/finches/a/zebrafinches.htm Adoption fee is $25 for 3 to 4 as a donation to Wildbird Recovery, a nonprofit wild bird rehabilitation center.